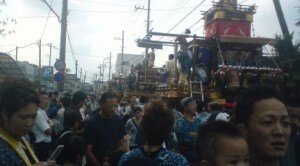 TsukuBlog | Getting Ready For The Big One- The Great Ishioka Festival (Ishioka no Omatsuri, 石岡のおまつり) which will be held today, Sunday and Monday- and some pics of the event! 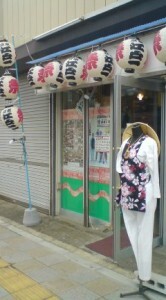 One of the several shops in Ishioka City which specialize in MATSURI wear and paraphanalia. These establishments were doing brisk business when I was in ishioka last week to check up on preparations for the great event. 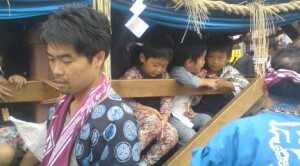 The pajama like outfits worn at the Ishioka Matsuri are called KOI GUCHI SHATSU (carp mouth shirts) and they are meant to look like tatoos on the wearer`s body. 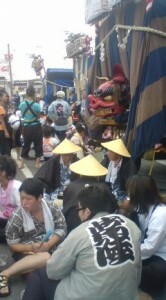 As you might expect I pay no heed to their advice, as the 3-day festival is my favorite in all of Japan. Yes, there ARE occassional fights and drunken brawls, and it certainly DOES seem a tad precarious for all of the kids, not to mention the infants, who have to be snapped up suddenly out of the paths of oncoming floats and the stampeding frenzy of revelers that accompanies them. In fact, I nothing stops me (and it would take a REAL emergency! ), I never miss it! 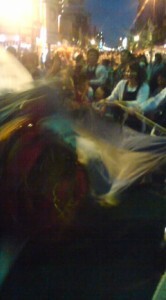 The Ishioka Festival always seems to me a reflection of Japans volcanic and highly seismic nature. Throughout the year Ishioka City is a sleepy backwater, rusting away as its former glory days slip further into the past (today`s city now lies on the ruins of what was the provincial capital ( KOKUFU) of this region more than 1,000 years ago). 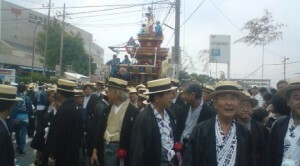 The people are for most of the year round as reserved and polite as any Kanto Region Japanese and surely would not usually show much passion. When the middle of September rolls around, however, all the pent up primeval energies erupt,especially on the second day of the 3-day bacchanalian bonanza. 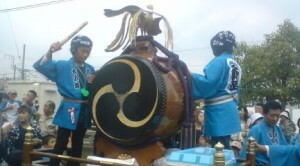 Last Sunday, I scooted over to Ishioka ( about 30 minutes by car from Tsukuba and 10 minutes by train from Tsuchiura), to check out the preparations that I knew would be underway one week before the Matsuri actually begins. 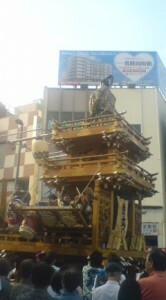 As I expected, things were busy, with each neighborhood taking their DASHIs ( floats) out of storage, and getting them ready. 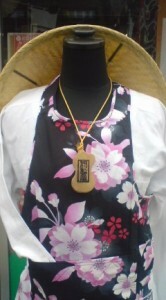 The stores which specialize in matsuri wear and goods ( I have never seen such shops anywhere else in Japan! 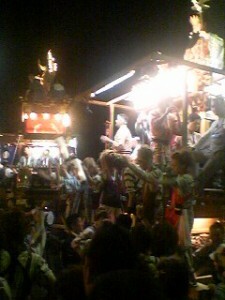 ), were also quite busy,with families, couples, and individuals searching for the perfect MATSURI-WEAR with which to get decked out and go crazy in this year. 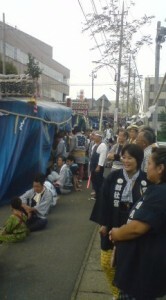 Even a week before things were to get underway I could sense the anticipation in the air, and in people eyes. 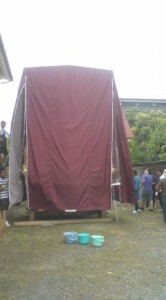 Its as if this is what Ishiokans wait around all year for. Things will get started on Saturday ( tomorrow) at about 2pm, just to the right as you walk out of the station. 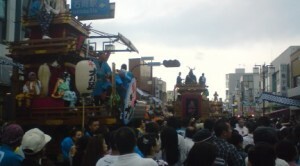 At that time, all the different neighborhood will be lined up in costume ( each neighborhood with have their own distingtive look) with their floats, carts, lions-masks. 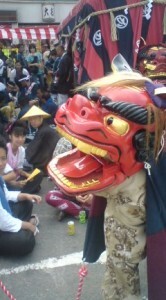 They will be getting ready- lion dancers will be stretching and getting the feel of the heavy masks, and musicians- flute players and drummers- will be practicing their licks. 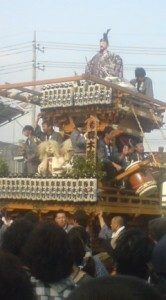 When the OMIKOSHI ( portable shrine ), things will get underway. 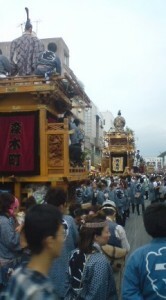 During the day, you can see the OMIKOSHI ( portable shrine) procession and enjoy the various floats carrying their musicians and dancers. 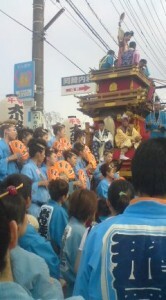 There special feature of this festival- SHI SHI MAI, or lion dancing. If you want to, the locals will be happy to let you have a go at it! Its not as easy as it looks to make the mask look alive and sensual, writhing and snapping! 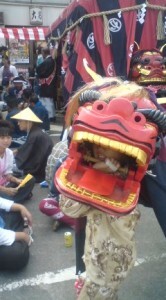 It is considered to be good luck to stick your head into the jaws of the lion-masks. 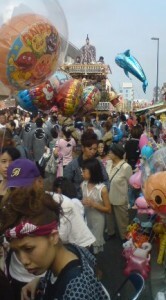 You will find that many parents with young children and even babies appear be offering their offspring to SHI-SHI, holding them up while the lion dancers pretend to bite down on the terrified little ones who are often bawling hysterically ( the more the kids are frightened, and the more they cry, the more the good luck!). 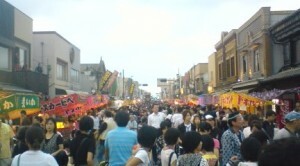 The main roads of Ishioka will be completely lined with YATAI ( vending stands) selling your traditional festival fare ( yaki-soba, okonomi-yaki, butter potatoes, choco-bananas)- plus some new additions to the regular festival menu- mainly middle-eastern Kebabs and shuarma ( its strange how Japanese Matsuris now often smell like a Levantine shouk!). 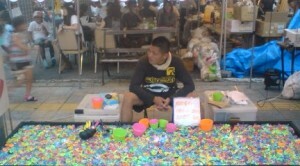 There are also lots of stalls which cater to little kids, at which they can enjoy scooping up superballs or goldfish, or pick a lottery ticket for prizes. Dont forget to explore the side streets either. Not only can you get a look at some very rustic old Japanese town-scapes, but the locals, take their breaks in these off the main streets areas and set up resting spots which are intersting to hang out at and photograph. 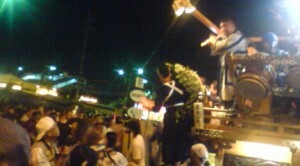 It is at night , however, that things really get interesting, and I would recommend that anyone interested in Japan stand out in front of Ishioka Station between 6:30 and 8:30 pm on the nights of the festival, as all the revellers, floats amd lion dancers come to converge at one spot and seem to battle it out for who can be whip up the most excitement. It is amazing. 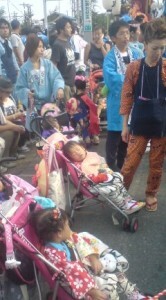 Japan is famous for its situational behavior. Professors who never lift a finger at home and never even set foot into the kitchen, run to get tea for guests at their office and serve it with great gusto ( something their wives would be amazed to see!) and women talking gruffly in slang to their friends over the cell phone will suddenly seem to tranform into another person as their voice shoots up an octave and switches over to a completely different style of speech when a stranger calls. Watching the people of Ishioka transform from their everyday mild-mannered Clark Kent personas into the Incredible Hulk for a three day period is for more one of the greatest mianifestations of this phenomenon. dont miss it! 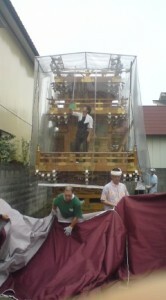 Taking giant DASHI ( floats) out of storage is a neighborhood event- one week before the matsuri. Waiting for things to get underway! And we`re off! 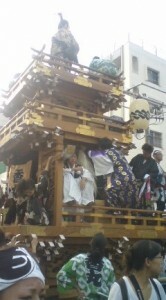 The Ishioka Festival begins! Dear! 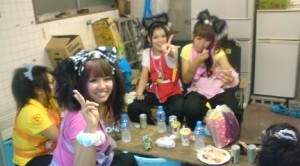 Dear! 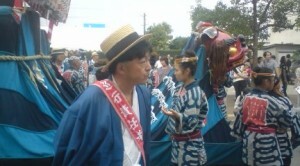 Avi-san’s comment about Japanese Professors and women made me to make a roar of laughter. Thanks!